It's early May and I’m looking out of the upstairs office window as I write this, and after the weather we’ve all been experiencing lately I’m happy to see the wisteria budding. In a month it will be knocking on the window and the tendrils will be making their way through the gaps in the sashes. This umbrella is made from polytunnel arches! Wisteria is often seen as hard to grow and hard to maintain. Don’t let the doom-mongers put you off! This sinuous climber is pretty easy going. It’s hardy, likes a damp soil and once it’s mature it will reward you with tumbling racemes that flower for up to two months and are highly scented. It grows in various locations around the garden here, facing all points of the compass. As long as it has some light it will flower. We’ve only got one south facing wall, which is the back of the Sunken Garden. 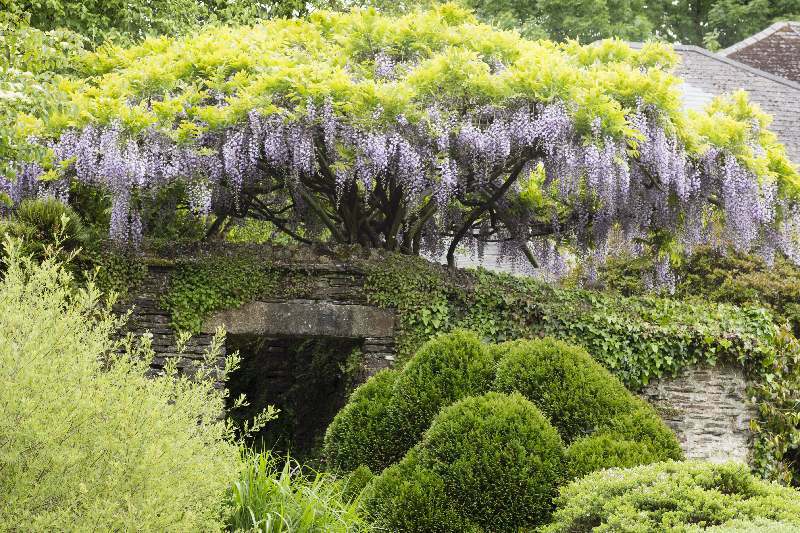 It's home to our earliest flowering wisteria, which is an old plant and an unknown white variety. I'm tempted to tell you is Wisteria 'Alba' but I'm not 100% sure. I am sure though, that it flowers earliest as it is in the warmest spot. I enjoy this plant year round - not just when it’s colourful. The sinuous stems create trunks that make great features as backdrops for other plants. It’s often grown over buildings and is best secured by wires - it’s not a self-clinger like ivy, so it won’t ruin render. It romps away here over walls, buildings and even a bridge. Given time you can shape it over structures which can bring real height and interest to any space. At the top of Tom's Steps we have it across an umbrella that’s made of old poly tunnel arches. That's one of my favourite features in the garden. I love the ingenuity and thrift of gardening and using old polytunnel arches to make an elegant feature that's been pictured in gardening magazines all over the world just sums up something that's very good about gardening. People seem wary of pruning wisteria, but it really is straightforward. Basically, prune the whippy summer growth a little in August and a bit more in February. If you don’t want to prune it, don’t. You won’t get as many flowers but it will get bigger, quicker. interestingly, the wisteria growing up the house next to the porch was really struggling and the head gardener at the time almost ring-barked it to encourage better growth. It worked and the plant is now much healthier. You might not be brave enough to near ring-bark your wisteria, but it's worth bearing in mind that the plant responds to brave pruning. See you in the garden soon -Nick.